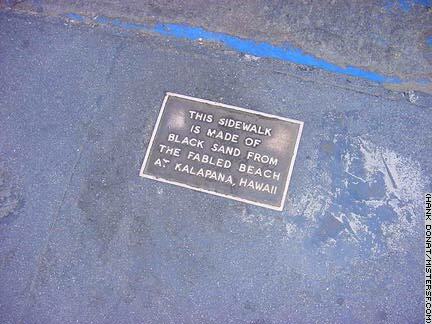 On the southeast corner of Geary and Powell streets lies a souvenir of Kalapana, Hawaii. In the late 1950s, a section of sidewalk was installed here incorporating sand from the famous black sand beach. Each year a little less remains of the Kalapana Sidewalk which was created by Matson Navigation Company to celebrate service to Hawaii and the opening of an office on the corner.